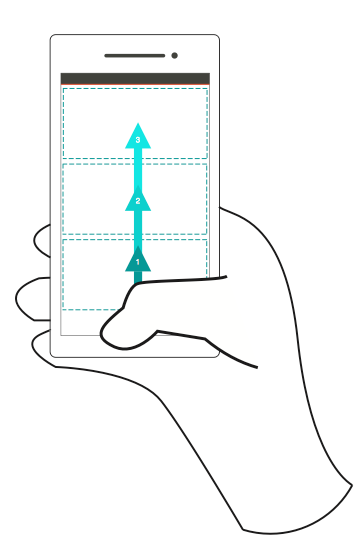 Check out “loving the bottom edge” for the most important bit of design guidance for your Ubuntu mobile app. This work has been a LOT of fun. It started when we were trying to find the zen of each edge of the screen, a long time back. We quickly figured out that the bottom edge is by far the most fun, by far the most accessible. You can always get to it easily, it feels great. I suspect that’s why Apple has used the bottom edge for their quick control access on IOS. We started in the same place as Apple, thinking that the bottom edge was so nice we wanted it for ourselves, in the system. But as we discussed it, we started to think that the app developer was the one who deserved to do something really distinctive in their app with it instead. It’s always tempting to grab the tastiest bit for oneself, but the mark of civility is restraint in the use of power and this felt like an appropriate time to exercise that restraint. Importantly you can use it equally well if we split the screen into left and right stages. That made it a really important edge for us because it meant it could be used equally well on the Ubuntu phone, with a single app visible on the screen, and on the Ubuntu tablet, where we have the side stage as a uniquely cool way to put phone apps on tablet screens alongside a bigger, tablet app. The net result is that you, the developer, and you, the user, have complete creative freedom with that bottom edge. There are of course ways to judge how well you’ve exercised that freedom, and the design guidance tries to leave you all the freedom in the world while still providing a framework for evaluating how good the result will feel to your users. If you want, there are some archetypes and patterns to choose from, but what I’d really like to see is NEW patterns and archetypes coming from diverse designs in the app developer community. Here’s the key thing – that bottom edge is the one thing you are guaranteed to want to do more innovatively on Ubuntu than on any other mobile platform. So if you are creating a portable app, targeting a few different environments, that’s the thing to take extra time over for your Ubuntu version. That’s the place to brainstorm, try out ideas on your friends, make a few mockups. It’s the place you really express the single most important aspects of your application, because it’s the fastest, grooviest gesture in the book, and it’s all yours on Ubuntu. This is a time of year to ponder what matters most and choose what we’ll focus on in the year to come. Each of us has our own priorities and perspective, so your goals may be very different to mine. Nevertheless, for everyone in the Ubuntu project, here’s what I’ll be working towards in the coming year, and why. It matters that we not exclude people from our audience. From the artist making scenes for the next blockbuster, to the person who needs a safe way to surf the web once a day, it’s important to me, and to the wider Ubuntu community, the people be able to derive some benefit from our efforts. Some of that benefit might be oblique – when someone prefers XFCE to Unity, they are still benefiting from enormous efforts by hundreds of people to make the core Ubuntu platform, as well as the Xubuntu team’s unique flourish. Even in the rare case where the gift is received ungraciously, the joy is in the giving, and it matters that our efforts paid dividends for others. In this sense, it matters most that we bring the benefits of free software to an audience which would not previously have had the confidence to be different. If you’ve been arguing over software licenses for the best part of 15 years then you would probably be fine with whatever came before Ubuntu. And perhaps the thing you really need is the ability to share your insights and experience with all the people in your life who wouldn’t previously have been able to relate to the things you care about. So we have that interest in common. It matters that we make a platform which can be USED by anybody. That’s why we’ve invested so much into research and thinking about how people use their software, what kinds of tools they need handy access to, and what the future looks like. We know that there are plenty of smart people who’s needs are well served by what existed in the past. We continue to maintain older versions of Ubuntu so that they can enjoy those tools on a stable platform. But we want to shape the future, which means exploring territory that is unfamiliar, uncertain and easy to criticise. And in this regard, we know, scientifically, that Ubuntu with Unity is better than anything else out there. That’s not to diminish the works of others, or the opinions of those that prefer something else, it’s to celebrate that the world of free software now has a face that will be friendly to anybody you care to recommend it. It also matters that we be relevant for the kinds of computing that people want to do every day. That’s why Unity in 2013 will be all about mobile – bringing Ubuntu to phones and tablets. Shaping Unity to provide the things we’ve learned are most important across all form factors, beautifully. Broadening the Ubuntu community to include mobile developers who need new tools and frameworks to create mobile software. Defining new form factors that enable new kinds of work and play altogether. Bringing clearly into focus the driving forces that have shaped our new desktop into one facet of a bigger gem. It’s also why we’ll push deeper into the cloud, making it even easier, faster and cost effective to scale out modern infrastructure on the cloud of your choice, or create clouds for your own consumption and commerce. Whether you’re building out a big data cluster or a super-scaled storage solution, you’ll get it done faster on Ubuntu than any other platform, thanks to the amazing work of our cloud community. Whatever your UI of choice, having the same core tools and libraries from your phone to your desktop to your server and your cloud instances makes life infinitely easier. Consider it a gift from all of us at Ubuntu. There will always be things that we differ on between ourselves, and those who want to define themselves by their differences to us on particular points. We can’t help them every time, or convince them of our integrity when it doesn’t suit their world view. What we can do is step back and look at that backdrop: the biggest community in free software, totally global, diverse in their needs and interests, but united in a desire to make it possible for anybody to get a high quality computing experience that is first class in every sense. Wow. Thank you. That’s why I’ll devote most of my time and energy to bringing that vision to fruition. Here’s to a great 2013.